This audio and book set is a user-friendly, no experience necessary, aural training course that provides a method of teaching and improving aural skills rather than just a programme of questions and answers. Designed for the novice musician from the age of 5 and up, the voice over instruction gently guides the beginner through the early stages of ear-training. 4) A shorthand system by which to transcribe the above timing elements quickly and easily. This is extremely useful for transcription questions in examinations, as it ensures the listener can capture and write out a rhythmic pattern in three hearings. In this preparatory set the easy rhythm shorthand system is demonstrated in a slow, stage-by-stage manner so even the youngest student can follow the system. Once this course has been completed, students will be able to handle the faster pace of Set One. This book includes a separate lift-out sheet with the answer keys so teachers can check their students’ results or students can self-check. Track listing sheets are included and are also available as a free download from this page. Click here for a complete track list for the Preparatory CDs. These files are in Acrobat format. If you would like to read a detailed review from the Saxophone and Clarinet magazine June 2004 edition, click here. 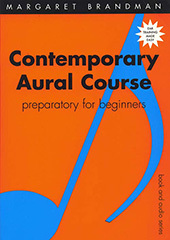 The audio for CD1 and CD2 of the Preparatory Aural Course is available in MP3 format. CD1 and CD2 in MP3 format.